What video format should I focus on? What budget should I allocate to my B2B video strategy? Should I externalize everything? How do I choose my video agency? This is the type of questions I hear a lot during discussions between B2B marketers. In this article I will try to share my experience in this area! It’s a fact: we all like watching a video rather than reading a long text bloc when it comes to learn about a product, a solution or an offer. Video marketing is nothing new, but still its perspectives of evolution are huge and permanent. Always segment and adapt your video material depending on who you are targeting. New prospects, prospects who already know your company but not converted yet and existing customers. I have seen to many videos trying to target the three types of audience in a same video, and this usually leads to a confusing and ineffective video. I am not saying that the video will not look good and fancy, you might be proud about it, you colleagues might like it, but to reach the Holy Grail, conversion and increase of your web pipeline it is not the right approach. I recently faced a situation where one of my top managers asked my to justify the ROI of a high budget video. Very frustrating to do this exercice when you are 150% aware and convinced about the importance of video marketing. However I had not much choice and got into a complex ROI calculation (far beyond the basic KPIs like number of views, likes, etc.). End of the story: I convinced my top manager, but I promised myself to find a trick which would avoid me to spend so much energy in such boring calculation. This is the moment when I started to use Wistia, an amazing professional video-hosting platform, which allows you to capture leads directly from your video. Indeed, the problem with YouTube is the inability to capture your audience. You can push your audience to land on your YouTube channel (links on your website, social media bar), but how to capture and identify your visitors? This you can do with Wistia, and it truly changed my life as web & digital marketer. 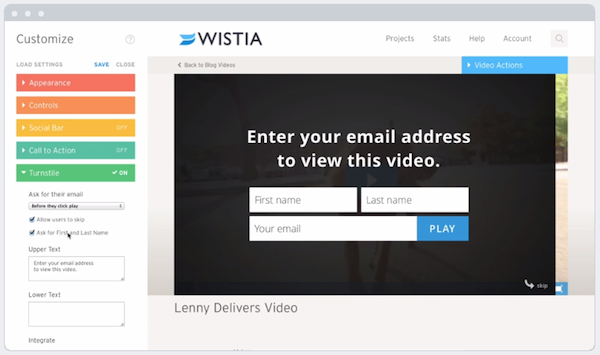 Wistia has a connector with Pardot (BtoB Marketing Automation by Salesforce), which has a connector with Salesforce obviously. The video marketing web-to-lead process was just very quick and easy to put in place from the moment I implemented Wistia. If you need advices in this area, feel free to ask, I will be glad to help. Choose the appropriate format depending on your objectives. Before choosing any format (screencast-based videos, interviews, video clip, 2D or 3D animated videos) just ask yourself what you expect from this video. If it is about “explaining, educating and entertaining” (cf. easyexplainvideo.com, a Hungary-based company I recently started to work with with the view of promoting a new Cloud-based solution) your audience and share with them a new concept, 2D animated video can be the appropriate format. If this is about illustrating the power of a certain feature, a screencast-based video with the product manager’s voiceover would probably make sense: nothing more convincing to see the person in charge of developing a product explaining “live” how powerful it is by manipulating the interface himself. This personalizes your product. The users of a piece of software love to see the faces of the engineer who developed it. Be careful with the length of your videos. In 2017, 2/3 of the worldwide data traffic will be videos. You can’t do without videos today, but use them smartly to catch the attention of your visitors, do not overwhelm them with to much information of they will feel confuse about your brand. You need to have in mind that 30% of the visitors stop watching a video after 30 seconds. Of course people prefer to watch a video than reading text, but that doesn’t mean that you shouldn’t keep the content of your videos concise and straight-forward. 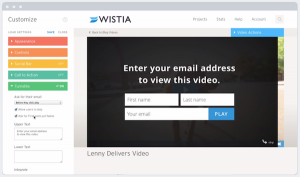 Two of the most powerful features of Wistia are its video heat maps and its very precise analytics. Those analytics, in my case or should I say in the case of my company, show that you can barely expect a high level of attention from your visitor after he/she watched more than one/one and a half minute of your video. Of course this doesn’t mean that you shouldn’t create videos longer than one and a half minute. Every market and persona is different. Choose a video agency that corresponds to the specificity of your project. I often hear marketing people tell: “You should find a freelancer to create this video, agencies are too expensive. A young fellow just out from school can do the same job for half the price.” I do not agree with this: it all depends on the scale and the typology of your project, as well as the level of professionalism you expect from the final deliverable. I have worked in the video industry before and the main lesson I learnt from my experience is: do not try to save money when it is about creating videos. Videos represent the image of your company. You can be as challenging as you want with the agency you hired, but do not try to minimize the costs or you will be disappointed by the deliverable. If you can’t afford a professional-looking video, don’t create a video. This statement does not apply to screencast-based videos. Indeed, with a very minor investment (200 dollars for an Active Presenter professional license) you can have access to some very professional and intuitive screen-casting tools. With the experience I have got in video creation, I can easily estimate the cost of the video, just at a glance. If you need advices in this area, just drop me an email and I will be glad to help. As an example, the video below cost around 20k€ to produce, while the second one cost 5k€. Conclusion: creating a video is not complicated those days, with the easy access to cameras and video editing software (legally downloaded of course…). However, creating a professional-looking video that is in phase with your brand identity and which will be able to generate highly qualified leads is another story. And for this you need help and assistance. Always choose an agency who corresponds to your needs. You don’t need to go for a big and globally recognized video agency to create some pieces of interviews of your product managers, but on the other hand do not expect big result if you work with a cheap and barely experienced freelancer to create the worldwide video marketing strategy of your 3000 employees company.